Welcome to the Turkish Travel Blog and my huge list of things to do in Turkey. The good news is that you are spoilt for choice. Turkey’s rating as the sixth most popular country in the world for tourism proves that generally everyone finds something interesting to do whether their interests are history, culture, nightlife, or lifestyle. Combine these choices with appetizing food, hospitable locals, gorgeous weather, idyllic beaches, some stunning landscapes, and you have the perfect combination of ingredients for a trip of a lifetime. Since, there are plenty of things to do and places to go , for this article, I’ve enlisted the help of Jill from BareFootPlus Travel. Her stories as a former Peace Corps volunteer in Turkey, interestingly explain how she built up her extensive knowledge bank of the country and she now spends her days planning personalized itineraries for people of off-the-beaten-track destinations, and insider tips for things to see and do, especially in Istanbul. Together we penned our favourite and the most popular ideas, and because it turned into a massive list, we’ve separated them into particular genres to make for easier reading and planning. Let’s get started. 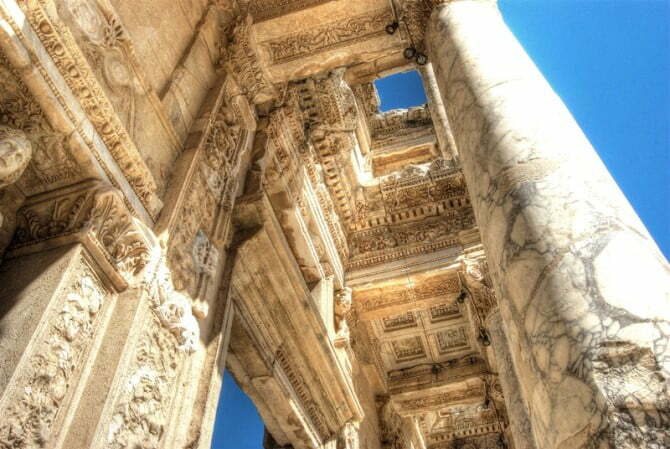 As the third largest city of the Roman Empire, Ephesus often occupies second place on the official list of most visited attractions in Turkey. I’ve been three times and will go back again and again, and once you see it for yourself, it is easy to understand why. Intense excavations and restoration of the ancient Greco-Roman city over many years have revealed temples, public latrines, the Celsus library, and a Hellenistic theatre. However, the Roman terraced houses with their mostly intact and impressive mosaics are my favourite landmark. 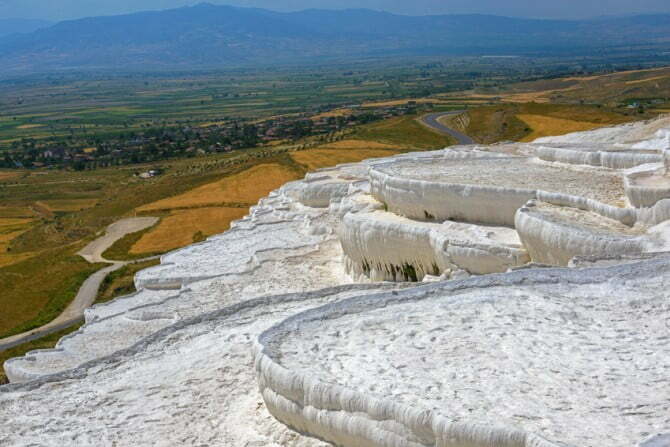 Just a 4-hour drive from Ephesus is the white travertine pools of Pamukkale and the ancient city of Hierapolis. Listed as a UNESCO World Heritage Site, the natural landscape of Pamukkale’s pools spilling down a hillside defies belief but is easily explained using science because solidified carbon dioxide water is responsible. I stayed overnight on my trip so I could also visit the nearby ancient sites of Aphrodisias and Laodicea but many people also go on a day-trip only. The lunar landscape of Cappadocia amazes visitors with its fairy chimneys, ancient underground cities, cave churches, and hotels. 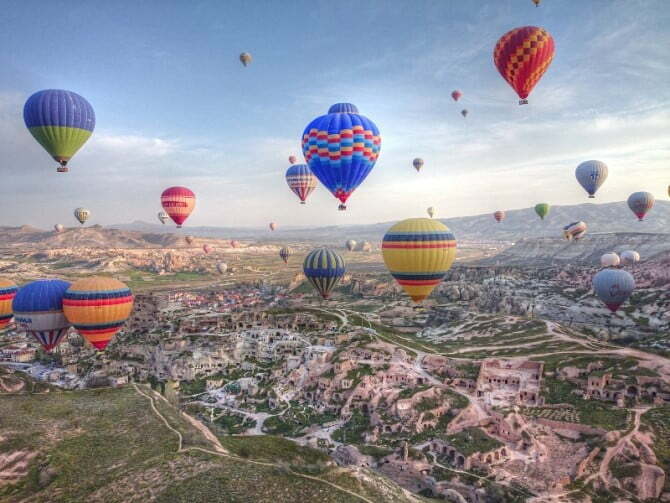 However, the top recommended thing to do is an early morning hot air balloon ride. Following a buffet breakfast, up to 30 or more balloons holding 6 to 20 people rise up to take advantage of wind speeds and conditions, against the sunrise. The scene is spectacular and often featured in travel brochures of the area, but I admit my fear of heights has got the best of me for this activity so I haven’t done it, despite visiting the region 3 times. Jill has though and strongly recommends it. Istanbul rivals Rome, Paris, and Milan as a top city break destination and the diversity of hotels, restaurants, and bars as well as the cultural and entertainment scenes prove why. All the historical landmarks are in the Sultanahmet district, a UNESCO World Heritage Site. Sailing in Turkey is one of my favourite past-times and during summer; most backpackers end their trip with a Blue Cruise of the Turkish Riviera from Fethiye to Antalya. The amazingly low price cabin charters cost approximately 300 euros with food and accommodation included. 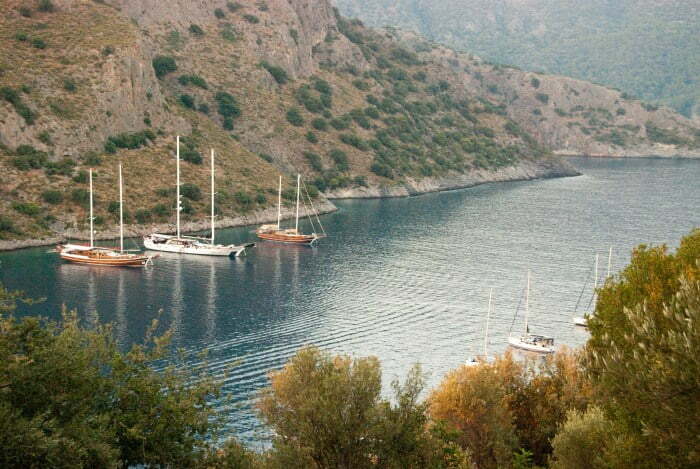 Another option is to sail from the other central hubs of the Turkish Riviera; that are Bodrum or Marmaris. Now this is where I start to get excited because you could spend a lifetime travelling around ancient sites in Turkey and still not see them all. Many empires and conquerors such as Alexander the Great have ruled these lands but Turkey also sat on the edge of ancient Mesopotamia, otherwise called the cradle of civilisation. Historical sites like Gobeklitepe and Catalhoyuk prove the area has been occupied since roughly 7500BC. That is mind-boggling! 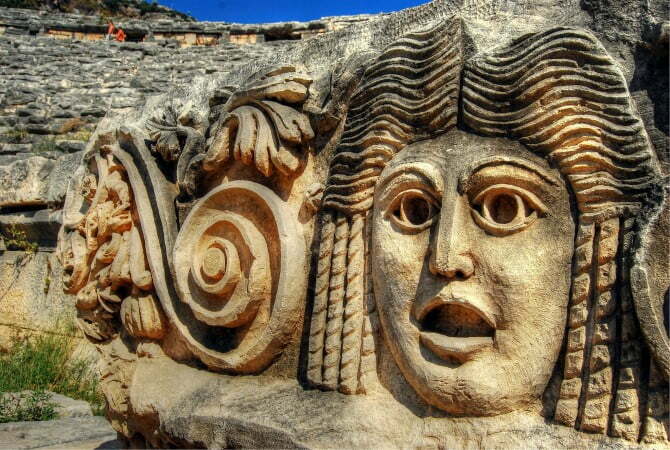 Turkey has 15 ancient sites on the UNESCO list and 60 more waiting on the tentative list! As well as the previously mentioned Old Istanbul, Pamukkale, and Ephesus, recent additions include the Black Sea city of Safranbolu and Bursa, the former capital of the Ottoman Empire. Excavations are always ongoing and every so often, a University announces a new find or discovery. When it comes to understanding the history of humankind, Turkey is definitely a country to visit so where should you go? 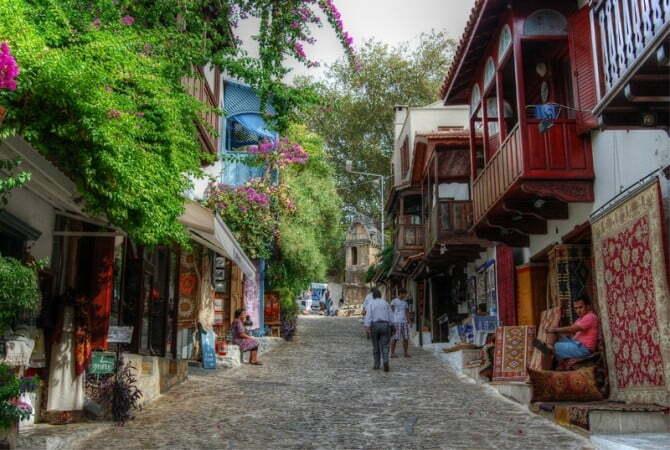 Well, including the ancient site of Ephesus and the Istanbul old district of Sultanahmet that were mentioned above…. The southwest coast of Turkey is brimming with historical sites but rather than list them all, it is better to explain that they are part of the ancient Lycian way. This is a registered and official 516-kilometer trekking route running from Antalya to Fethiye, that includes coastal resorts such as Kas, Kalkan and Cirali. Including ancient cities such as Myra, Olympus, Tlos, Phaselis, Letoon, Xanthos, Patara, the mapped route also features unusual places like the Ghost Village of Kayakoy. Trekking to all these historical places would take an estimated 3 months but you can cheat like I did. Most sites more or less sit on or around the main D400 coastal road so I used bus transport to get between them! Most people know Turkey is a secular, Muslim country. Lesser known is its Christian history. As one of the first places in the world that embraced the new religion of that time, a religious tour of the country includes sites like the Goreme Open Air Museum featuring early 13th and 14th-century cave churches with frescoes intact. The Western coast also pays homage to the Seven Churches of Revelation as mentioned in the New Testament of the Bible and the House of the Virgin Mary, a pilgrimage place for many Muslims and Catholics and suspected by some to be the place of her assumption. 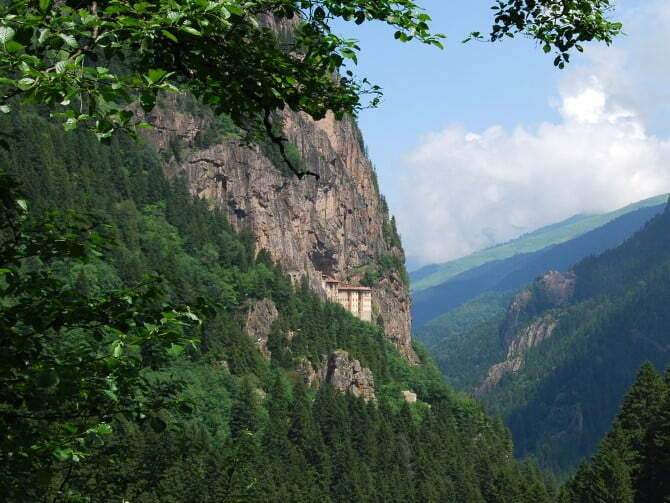 In the Northeast of Turkey, the spectacular 14th century Sumela Monastery clinging to the side of a mountain is where a monk saw a vision of the Virgin Mary. 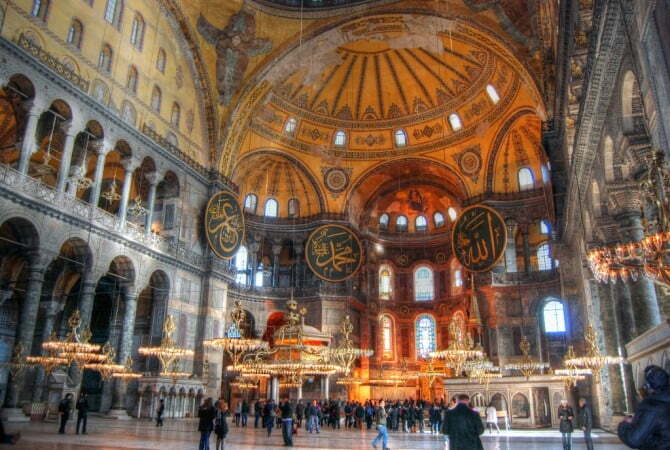 If time is limited, though, stick to Istanbul, and Christian places like the Hagia Sophia, the church of Anthony Padua and the Hagia Erine, which was the first church of Constantinople. Turkey’s main tourism season runs from May to October. Outside of these months, many of the coastal resorts shut for business and beach holidays are impossible because of the weather. So what can you do between November and April? Plenty! City breaks are big business in Turkey. 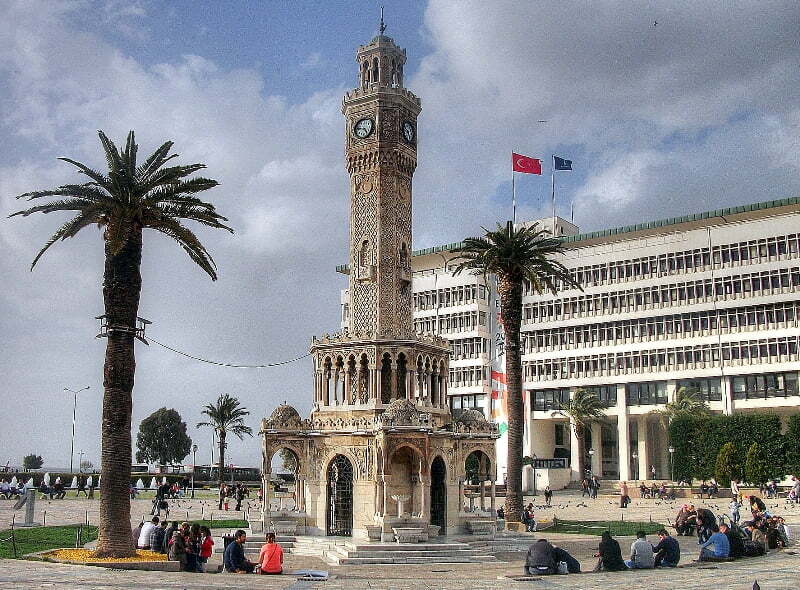 In addition to Istanbul, Izmir is an attractive metropolis playing host to a wildlife park, ancient agora, Kadifkale (castle), Asansor, Teleferik (cable car), Konak Square and much more. The second most popular holiday destination though is Antalya and while the beach resorts are quiet, the city centre opens for business as normal. 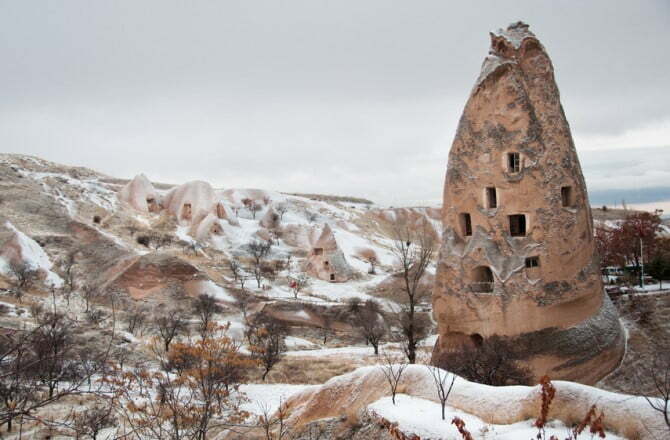 During most winters, a covering of snow and colder weather is guaranteed, but Cappadocia is open all year round. As mentioned before, it is an attractive area of Turkey and if it is too cold to trek, hire a car to see the central towns of Goreme, Uchisar, Urgup and Ortahisar. 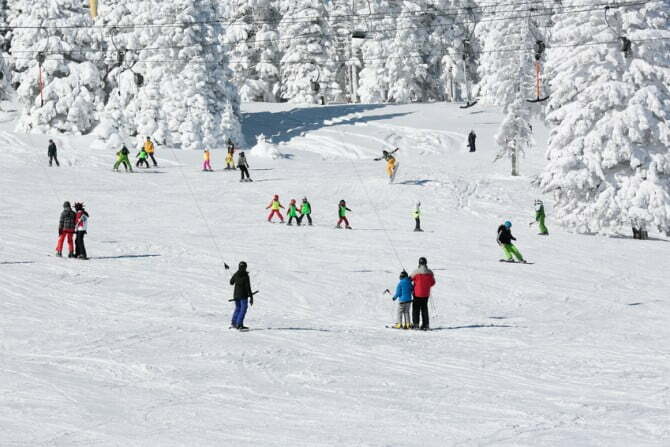 In recent years, Turkey has pumped a lot of money into ski resorts and their popularity is slowly but surely rising. I’ve never done it myself since adrenaline sports are not my passion in life but fans say the top centres for skiing include Uludag, Mount Erciyes and Erzurum. At the turn of the century, Turkey embarked on an extensive 20-year plan to increase tourism in Turkey. One area to be improved and promoted was adventure sports and the results have been pretty amazing! Olu Deniz and Kas are now the top destinations for paragliding while Antalya holds the crown for white water rafting. In Kas, scuba diving, sea kayaking and canyoning, are popular things to do. Mountain biking is a top recommended activity in Cappadocia and this is seen in the yearly biking festival. 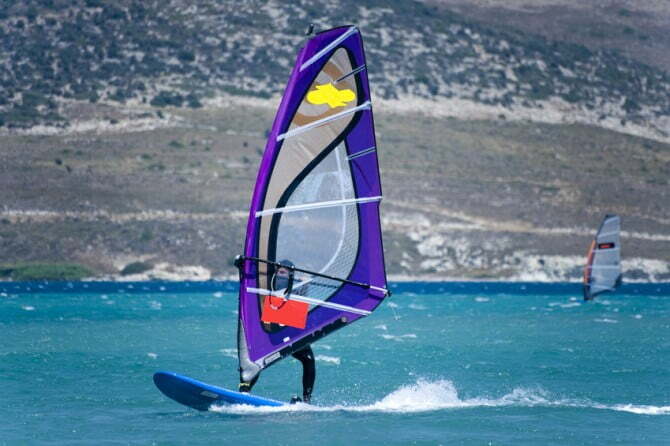 Alternatively, head to the northeast Kackar Mountains for mountaineering experiences taking you to remote villages, while Gokova Bay has earned a reputation as a kiteboarding centre of excellence and Alacati has burst onto the international scene for windsurfing. 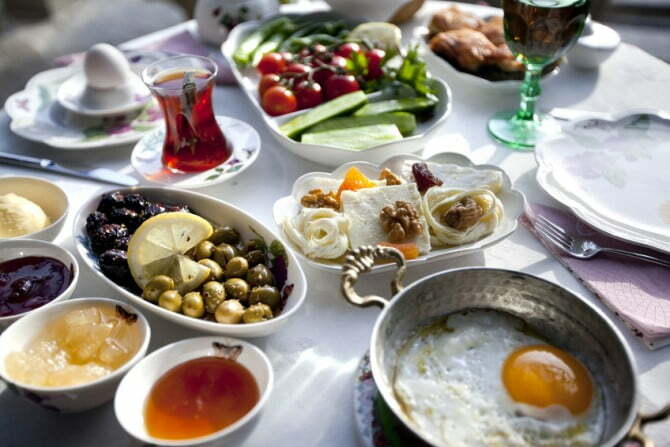 In most places along the west and south coasts, a weekend trend for Turks is to head to countryside establishments serving traditional village breakfasts among scenic landscapes. Organic and homegrown ingredients usually include eggs, Sigara Borek (cheese pastries), tomatoes and cucumbers, bread, jams, olives, meats, honey, and condiments. 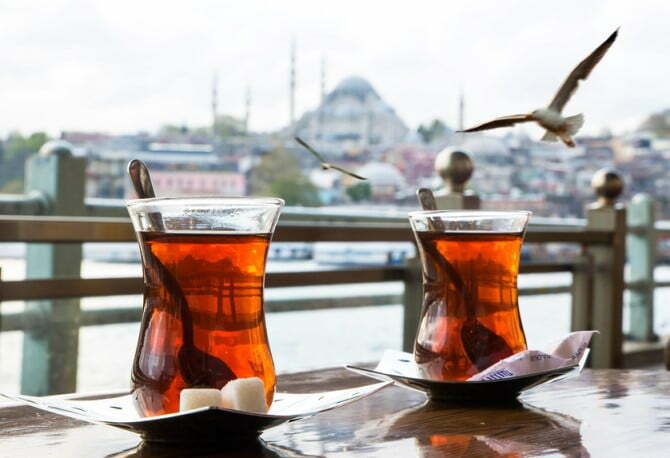 Turks drink a lot of tea but don’t fall for the touristic version of apple tea because it is a gimmick. Instead, try the tulip-shaped glasses of sweet, black tea. Also, Ayran, a mixture of yogurt, water and salt is extremely refreshing during the summer, despite the weird blend of ingredients, while Raki is the national alcoholic drink, similar to Ouzo. Combined with water to form a milky white liquid, its nickname is lion’s milk! By far, the most popular dessert and snack is baklava, layers of filo pastry, filled with nuts and covered with sticky syrup. Sold all over Turkey, locals say the best version is from Gaziantep. In Istanbul, many shops stemming from that region have become popular and are classed as the best places to buy baklava in Turkey. 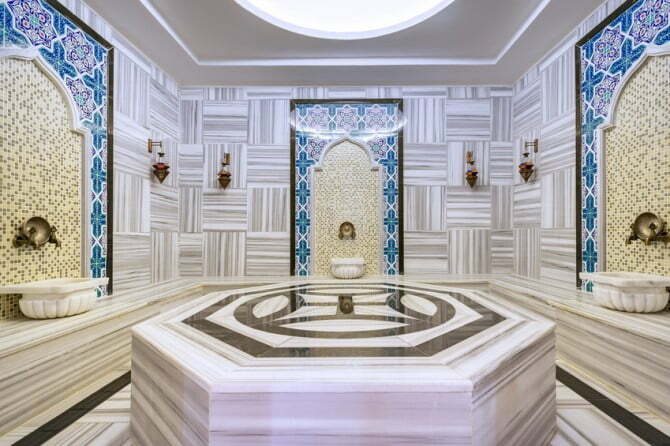 Turkey’s heritage and culture is extremely diverse and varies from region to region. This is mainly due to its extensive historical timeline and fusing with other cultures such as Greek, Armenian, Georgian, Kurdish, and Arabic. While the four suggestions above are generic, culture fans should research different destinations. For example, the Northeast region is home to the Laz and Hemsin communities of Turkey who are traditionally plateau dwellers. 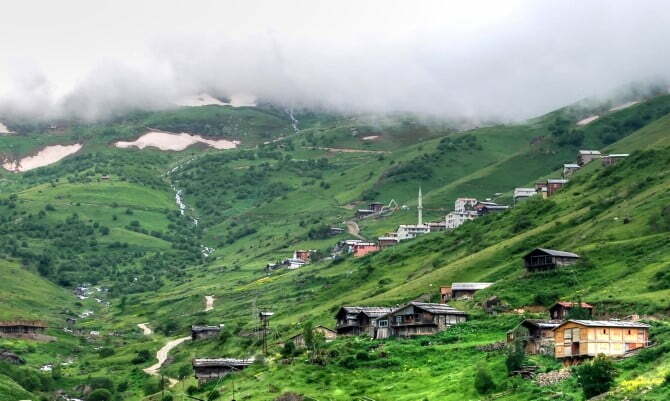 It is also the tea capital of Turkey thanks to its fertile soil and ideal weather conditions and Trabzon is well known for producing hazelnuts. Every region normally has a speciality food dish as well. Kars city is famous for its cheese; the Mediterranean coast is known for oranges, and the Aegean coast is the home of olives trees. Istanbul is the ideal place to sample street food (Simits, roasted chestnuts, roasted corn) while Beypazari is the home of the humble carrot, and Cappadocia has some awesome wineries. The list goes on and on. Turkey is a family-friendly destination and kids are accommodated in every way, whether you are in restaurants or traveling on local transport. At a guess, though, Antalya probably comes out as the most family friendly destination. Large hotels in the region incorporate kids’ clubs, water sports, and children’s activities into their entertainment schedules. Outside of the hotel, the biggest aquarium of Turkey, Sand City at Lara beach, 3 aqua parks, and shopping malls with cinemas should keep kids happy. Otherwise, in Antalya and most of the coastal destinations, daily tours suitable for children include Jeep safaris, Lazy Day Boat Cruises, and scuba diving. So this massive list of things to do in Turkey should give you plenty of ideas to get started. If travelling independently within the country and organizing your own trip is a daunting thought, the experts at BarefootPlus Travel have created several itineraries that can be seen here. Alternatively, they also offer a customised trip planning service. Where-ever and however you travel, I guarantee you will enjoy your time in Turkey which, personally, I think is one of the best countries in the world. Natalie — wow! What a wonderful list of things to do in my favorite country! After having lived near Adana for 2 years, I can vouch for your recommendations. They are all spot-on. Oh, my goodness; don’t get me started on my List of Favorites. It is lengthy! I have loved your blog (read it every “episode” while I was at Incirlik Air Base / 2012-2014) and still love your entries. Your posts always make me want to visit Turkey. 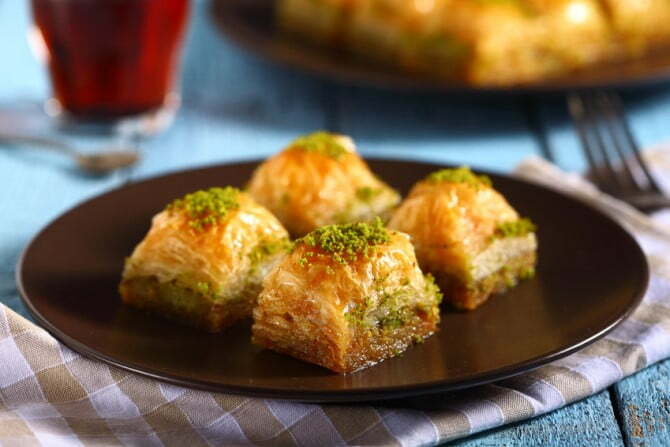 And, now you make me want baklava!